I don’t often get good ideas, but when I do, they’re usually from somebody else. One fun part of getting comments is that they sometimes link to other blogs, and many of you are also writing about zero waste and/or minimalism. That makes me so happy. Like, there’s a whole tribe of us out there doing this stuff! That’s gotta have some kind of impact. Anyway, last week I clicked on a comment from Jennifer, who writes at Sorting Buttons (hi, Jennifer!). She had written a post about cleaning out the ol’ cleaning supplies a la KonMarie (still haven’t read that book, by the way. I’m sort of wondering why I’m resisting at this point) by putting everything in one place and then sorting them out from there. Because sometimes you forget what you have and buy something you don’t need … or think you have something and then end up not. Sometimes you get stuff and you don’t use it. Sometimes you have huge bottles taking up space with like a tablespoon left inside. It’s good to assess the situation. 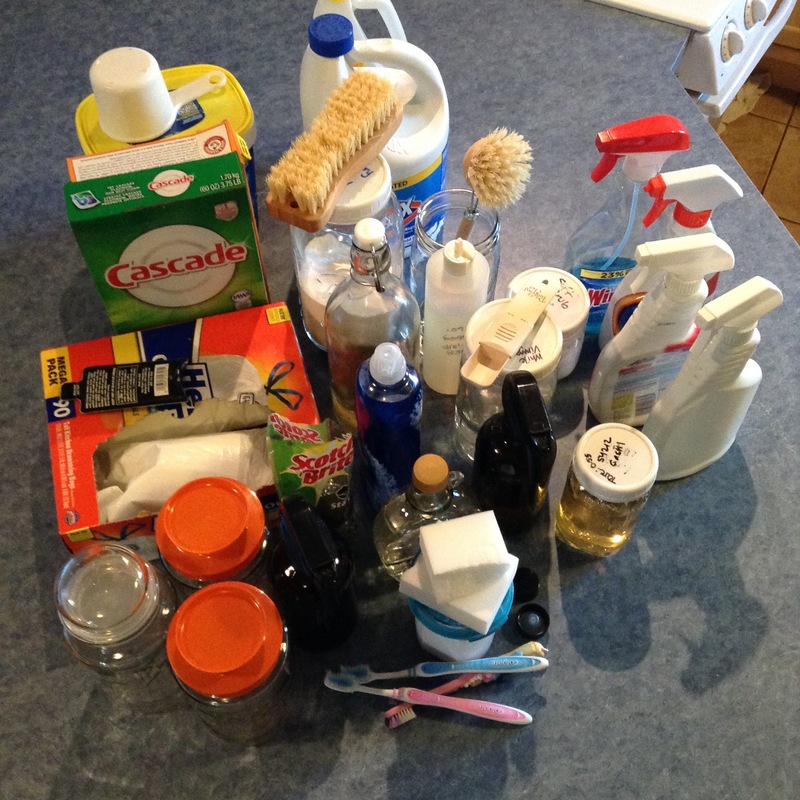 On Wednesday, I hunted down each and every cleaning supply we have in this house: Under the kitchen sink, in the laundry room, in each bathroom. And then placed it all on the kitchen counter. So: A box of dishwashing detergent (Eric bought it as a test when our dishwasher stopped working), a box of plastic garbage sacks, bleach, OxiClean, floor cleaner, Windex. Some reused plastic spray bottles, okay, that’s not so bad. Ugh, stain remover, and that’s pretty full. Bulk castile soap, bulk dishwashing liquid, that’s pretty awesome. But way more supplies than I thought I had, to be honest. That kind of depressed me. And … kind of energized me. Here it all was in black and white: this is information I can use. I had less than a cup of bleach left, so I decanted that into a glass jar and recycled the jug. I did the same for the OxiClean — same situation, less than a cup, that purchase is on Eric, by the way, but I guess we’ve been working on it for a couple of years now (does that make it better?). I was tempted to decant the floor cleaner, too, but I decided to just leave it in the plastic jug. And just shrugged my shoulders at the stain remover and decided it wasn’t worth the fight. I found some stainless steel scrubbies — I forgot I even had those — and put one in the laundry room in case anyone decides they want to scrub out a tub with it. (Warning: My Aunt Ann does not approve. She has a home store, so she would know. I haven’t had any issues with it, though.) (Hi, Ann!) Ditto with an old Magic Eraser (torn into three parts because you know it’s just going to disintegrate). A little more crowded than I’d like, but some of this just needs to get used up and then I can go on with my life. Oh, geez, and some dish soap. I don’t even know where that came from. So I added that to what was now becoming Cleaning Central. 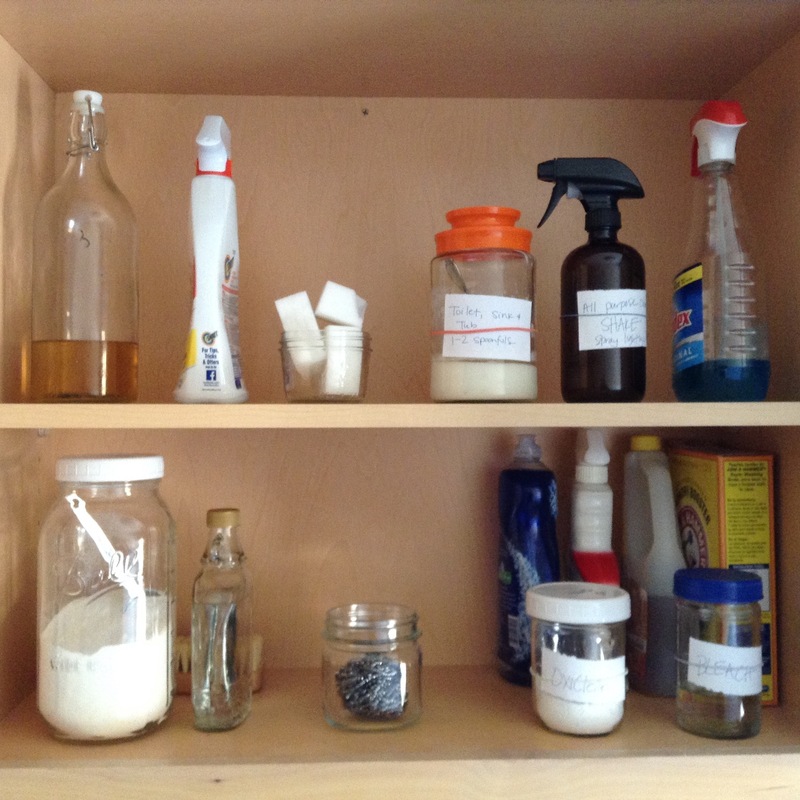 To give the fam some zero waste cleaner options, I made a batch of “soft scrub” and “all-purpose cleaner” (for the sink, toilet and shower, and counters, respectively). Those I put into glass containers — one an old Tang jar my favorite mother-in-law gave me not too long ago, and another in a pretty glass spray bottle I ordered with my safety razor. For some reason I do not understand, we have a lot of rubber bands in Johanna’s art drawer, so I used those and paper to label what was in what. Dorky, but easy to take off. 😉 The Windex is close to being out, and that’s awesome. I put it back with plans to just reuse that ugly plastic bottle when it’s gone — all it takes to make a window cleaner is water and some white vinegar — but also my will is weak and those brown bottles are awesome, so who knows, I may end up with another set. And then I decided my half-used box of washing soda could go live here too. Oh, and moved the trash bags to another laundry room cupboard, since I don’t need them in the kitchen anymore. I recently purchased a large scrub brush thinking I could use that to remove stains from clothing, but I haven’t used it yet. It’s one of those bamboo/some sort of plant bristle ordeals. Zero waste, but unnecessary, as it turns out. With the laundry room sorted, I tackled my kitchen cleaners. I have a few I use constantly: The bulk dish soap and castile, “soft scrub” for the sink and all-purpose cleaner for the counter, and that stupid box of dishwasher detergent. A jar of white vinegar. Another zero waste bamboo/plant bristle cleaning brush for dishes, another mistake. (I think it’s probably more for flat things, not rounded things, like jars.) A stainless steel scrubby, a “deep cleaner” made with baking soda and salt. And in the end, it took longer for me to write this post than it did to actually sort things out. I didn’t necessarily get rid of anything, but I did free up some space under the bathroom counters, and it feels much more organized. I may need to clean more often, however, in order to use up a few things. Anyone done a similar project? Next up: Another round of Project 333. This entry was posted in zero waste and tagged cleaning supplies, reusable containers, zero waste bathroom, zero waste cleaning, zero waste cleaning solutions. Bookmark the permalink. Keep in mind that the original containers have information on what to do if something is accidentally ingested or gets into your eyes, and warnings about dangerous interactions. I hadn’t thought of that (my kids are past the “I have no idea what this is so I’m totally going to put it in my mouth” phase). But you bring up another reason I’m keen to go all-homemade cleaning products: I don’t have to worry about any caustic clouds when mixing water, baking soda and castile. Good info! I’m willing to “risk” it (I don’t actually feel it’s much of a risk — and anyway I didn’t find anything on my washer that warned against it) but I didn’t want to lead someone down a path and then have them cursing my name later. I’ve seen a lot of posts that extol the virtues of vinegar … and just as many comments from people saying it’s a terrible idea. Life in a nutshell, I suppose. Thanks for the blog link! The first time you linked I actually clicked on it thinking, ‘Huh, sounds like an interesting post, maybe Jennifer will be a kindred spirit!’ and then showed up on my own blog before realizing what was going on! You’re right, sometimes it takes more to write about the sorting process than to actually do it.